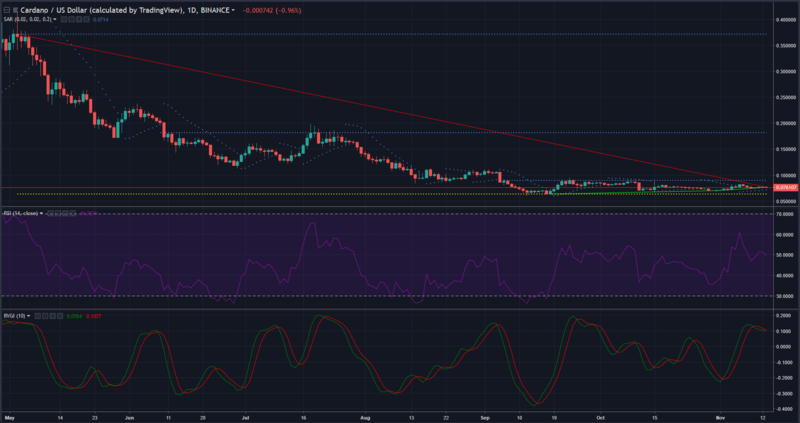 Cardano [ADA] has done well to find support levels in its recent recovery run, regaining the price range in the mid $0.070s. This has resulted in a formation indicative of a bounce upwards, a claim that seems to be backed up by the technical outlook for the coin. An uptrend is seen from $0.0608 – $0.075, demonstrating the sharp upward movement by the price, suggesting a clash with the downtrend from $0.082 – $0.077. Support levels are visible at $0.068 and $0.075, with the latter providing the price with momentum to test the $0.078 resistance. The Aroon indicator shows that a trend reversal is in progress, with the downtrend decreasing in power as the uptrend witnesses a sharp hike. The MACD is set for a bullish crossover. The Klinger Volume Oscillator is demonstrating a bullish crossover with a continued upward movement. In the long-term outlook, an uptrend is visible from $0.063 – $0.07 – $0.076, with the dominant downtrend showing price movement from $0.037 – $0.076. A support level is seen at $0.063, with the coin yet to set resistances at $0.089, $0.181 and $0.37. The RSI shows that buying and selling pressure have stabilized in the market. The Relative Vigor Index is demonstrating a bearish crossover. The Parabolic SAR is bullish. 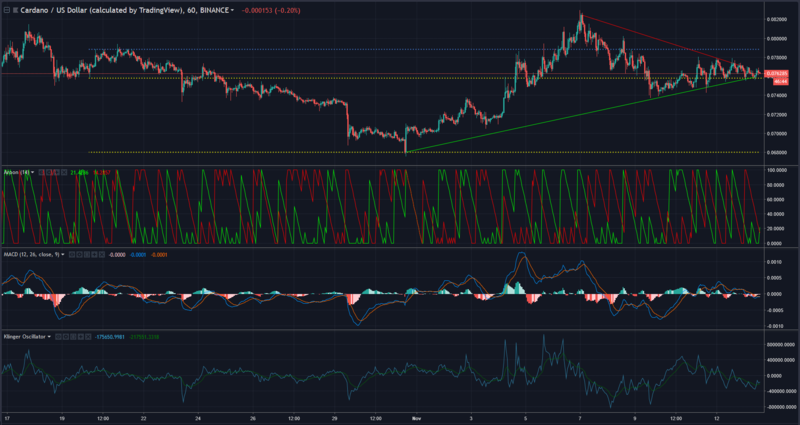 The general outlook for Cardano’s price is bullish and might see the coin test the resistance levels it struggled with during its recent hike. The first resistance to be tested will be at $0.078, with further resistances at $0.089 and $0.181. The post Cardano [ADA/USD] Technical Analysis: Bulls look ready to push price upwards as coin is set to test bearish pullback appeared first on AMBCrypto.